Peaceful Patonga – Outdoor Fun! | Travel Ideas! Patonga is one of the few towns on the Central Coast that retains its ‘sleepy seaside atmosphere’ (a 1.5-hour drive from Sydney). With only a few main shops in town set amongst peaceful scenic surrounds – this is nature and a seaside village at its best! 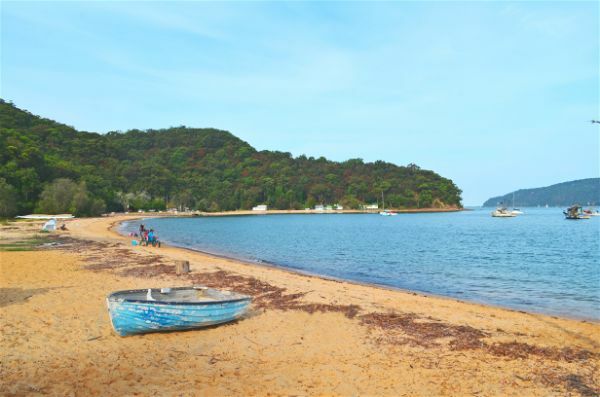 If you’re looking for some outdoor fun, there are numerous activities to choose from at Patonga, including camping, kayaking, hiking, swimming, fishing and boating, or take a leisurely stroll to a boutique art gallery (where you can see artworks on display in the shopfront windows), and if you fancy a ferry ride to Barrenjoey, catch the Palm Beach Ferry. With spectacular views of Brisbane Water National Park and it’s undulating mountain ranges, to Brisk Bay and a vast outlook across the water to the Hawkesbury River and Broken Bay, it’s no surprise this area has become the perfect city escape! Patonga is believed to be a Kuring-gai Aboriginal word, meaning ‘oyster’ more accurately pronounced ‘Batonga’. Prior to European settlement, the area around Patonga was inhabited by the Kuring-gai Aboriginal people. In 1789 Governor Phillip sent a party to explore Broken Bay and the Hawkesbury River. They observed Lion Island, however, there were no recorded observations about the Patonga area. The first European settlement of the area is believed to be during the 1860s, land here was surveyed and granted to John Hatfield in 1839. The land was then subdivided by a subsequent owner who died in the wreck of the Dunbar in 1857 (the ship was built in 1854 in Scotland, it was one of the many large ships that began trading to Australia as a result of the gold rush). In the 1930s during the Great Depression Patonga was a popular place to settle due to the prospects of sustainability – people were able to live off the land and catch an abundance of fish in the area. In 1937, a main road was built from Umina. Prior to that, the only access was by boat or bush track. The Patonga Caravan and Camping Area is located in a secluded and scenic part of town – in between Patonga Creek and the waters of Broken Bay, it is also surrounded by Brisbane Water National Park. During non-school holiday time, the campground attracts a variety of campers, especially those who enjoy exploring the outdoors. Whatever you choose to do, some things are highly likely: due to its idyllic surrounds this campground will help you to unwind, switch off from a fast-paced lifestyle and reconnect with nature. During the summer school holidays, The Patonga Caravan and Camping Area is well known by families seeking a fun city escape – half of the site is surrounded by water, which means children can swim, utilise their inflatable kayaks, and explore – while mum and dad sit back and relax on the water’s edge and watch, or join in! It’s not unusual during the summer months to see picnic chairs that line the banks of the river, where adults comfortably seated, supervise the little ones as they frolic in the water. The site includes modern amenities and sheltered BBQ facilities, a children’s playground, and they even have two tennis courts – if you happen to be in a sporty mood! 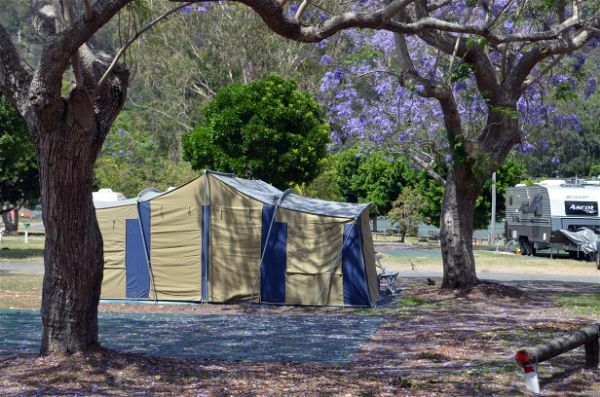 To make a booking at this campground, view the Council website, bookings can be made via phone or email (being a smaller campground the response time may take a little longer compared to larger campgrounds). If you’re looking to book a campervan scroll to the bottom of the article to view a fun range of campervans. Along the main drive of Patonga (Patonga Drive) you’ll see a road to the boat ramp as you approach the village, slightly hidden (on the left before you turn right into the village). If you’re thinking of boating this is usually a quiet area except during the summer months. The calm waters at Patonga not only offer opportunities for swimming, fishing and boating, but canoeing too. Canoeing or Kayaking on these calm waters is a great way to explore these vast waterways. And if you feel like having a wander and exploring by foot – not far from the beach, just around the corner from the Boathouse Hotel are a few quaint art galleries (to check opening hours for the Patonga Bakehouse Gallery, contact Jocelyn Maughan, see website). Coincide your trip with the Patonga Blues Across the Bay Festival, held on the grounds of the Broken Bay Sports and Recreation Centre, it accessed by ferry, and is a 10-minute scenic ride across the waters to this fun destination and festival! Or another festival worth seeing, although not in this area is the Five Lands Walk. With just a 15-minute drive to Ettalong, free public buses transport people to this event. This festival is held in June, for more information see the Weekender Travel website for our article. The Patonga to Peal Peach walking track is the best way to explore the area by foot, and is one of the most popular hikes in the area. However, you’ll need your walking shoes for this one! From the campground, it is a 15-minute walk to access this 4.3km (one-way) hiking track, which is at the opposite end of the beach from the campground – walking past the Boathouse Hotel, either along the sand (at low tide) or on the pathways to the beach. You’ll traverse a range of different areas from narrow dirt bushland trails, wooden and stone steps to a wide management trail. Feel the tranquillity of the bushland as you trace some of the Great North Walk. One of the highlights of the area is Warrah Trig Lookout – a short distance from the track. Enjoy spectacular views overlooking Hawkesbury River and the Pacific Ocean – out towards Barrenjoey Lighthouse at Barrenjoey Headland – Palm Beach, Sydney’s most northern point. The walk ends on the lovely streets of Pearl Beach – where you can enjoy a hard-earned relaxing cafe meal at Pearl Beach Cafe! Opposite the beach and cafe, there is also a children’s playground here too. There is a limited bus service from Pearl Beach to Patonga, this is a 30-minute bus ride back to Patonga (see bus timetable). Well known by media personalities – Pearl Beach is a favourite getaway destination due to it’s secluded and quiet location. This place like Patonga – feels a world away! The main road of Patonga is lined on one side by Brisk Bay and spectacular water views, and on the opposite side is The Boathouse Hotel, this building stands boldly, with it’s classy white, blue and grey tones – it is beautifully set amongst nature. And that’s all you really need here. 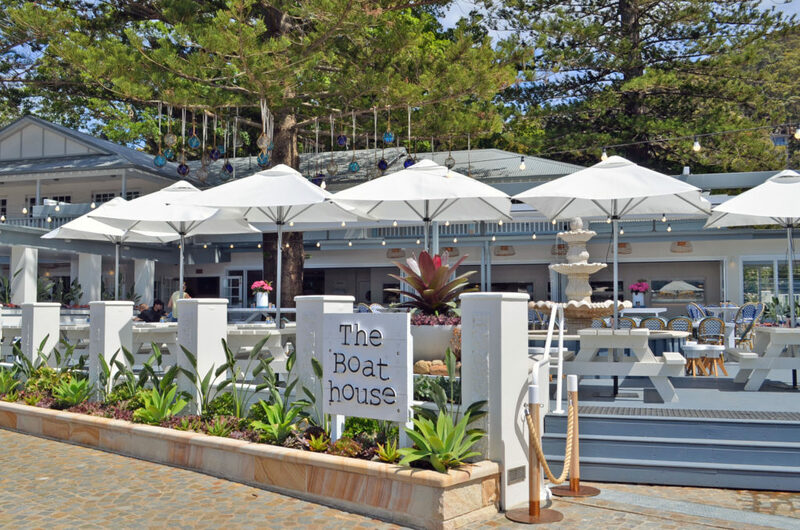 A 10-minute walk from the campground, the newly renovated Boathouse Hotel (which now offers accommodation) is one of eight venues of The Boathouse Group, which also include hotels in areas such as Shelly Beach, Balmoral and Palm Beach – the first established of the group. Food and dishes range from grilled barramundi, beef carpaccio, Sydney rock oysters, crumbed dory burger, to rare yellowfin tuna pasta. While the restaurant provides an upmarket experience in a relaxed setting, their takeaway shop offers al-fresco opportunities for customers. It’s not unlikely to see a few tourists sitting on the sandy beach enjoying an al-fresco lunch, eating steaming hot fish and chips with an entourage of sea-gulls waiting for leftovers. Menus from both the Boathouse Hotel’s restaurant and takeaway shop can be enjoyed in either of their settings; inside bar or al-fresco dining area – overlooking Brisk Bay! (For the latest updates see the Patonga Boathouse Facebook page, and for the closest supermarkets and other eateries, see our guide – The Ultimate RV and Campervan Beach Holiday. Apart from The Boathouse Hotel and a few boutique galleries, there really is nothing else here but nature and tranquillity, and that’s what makes Patonga what it is – a peaceful getaway. If you like the outdoors and you’re looking for the perfect city escape, a place to unwind and relax – this is the holiday destination for you! Patonga sounds really cool and interesting. Before reading this article today I did not know about this town. But after reading this whole article and knowing all the fun and amazing stuff you can do there I really want to go there now. Hopefully one day I can go there. Thank you for writing about this town and sharing it with us. Hi Sujandar, you’re welcome! I’m so glad you enjoyed reading this article. And hopefully if you get to travel to one of these holiday destinations mentioned on our website, you’ll know all about the fun stuff you can explore from our guides, they are insider tips ;-)! Hope you get to visit one day! Thank you for your comment, much appreciated! I found Patonga a good place to recommend to people who want to relax. Hi Julienne, you’re welcome! It is important to change our routine sometimes and find ways to relax, isn’t it. And Patonga certainly helps us with that! Too right – you can enjoy the outdoors such as camping, walking, and then enjoy a lovely meal at sunset overlooking spectacular water views too! Ah that’s the life, just bliss 🙂 Don’t forget to let your friends know too – that they can organise their holiday here; campervan and campsite booking all on this website! This Kombi Lifestyle looks like the type of life I think about when the stress at works gets to be too much. Does he Kombi Lifestyle mean laid back and relaxing? Well, if it does it sure looks like a place that I’d like to retire. Too bad I can’t check out forever and live there? I’ve always wanted to visit Australia or New Zealand. After reading this travel brochure I’m going to need to speak with a travel agent. Hello Shelley, I have enjoyed reading your post on Patonga. I plan to travel the world one day, and I didn’t know anything about Patonga until I came across your site, and it looks amazing. I would love to travel there and go canoeing for the second time, and try out kayaking for the first time. Camping is something I have never done before, and it would be perfect to go camping and hiking in Patonga as part of a summer vacation. And also, the food sounds amazing too!! Thanks again, and I wish you the best of luck with your site. Hi Ahmad, yes you are right – the food is amazing at the Boathouse Hotel, it’s just divine! 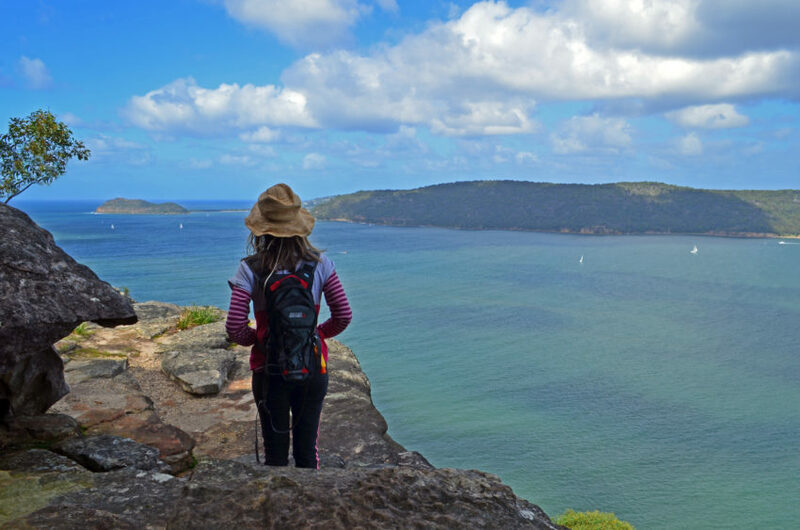 Camping and hiking at Patonga during summer is the perfect time of year, where on hot days after exploring the outdoors, the beach is great for a refreshing dip in the sea! 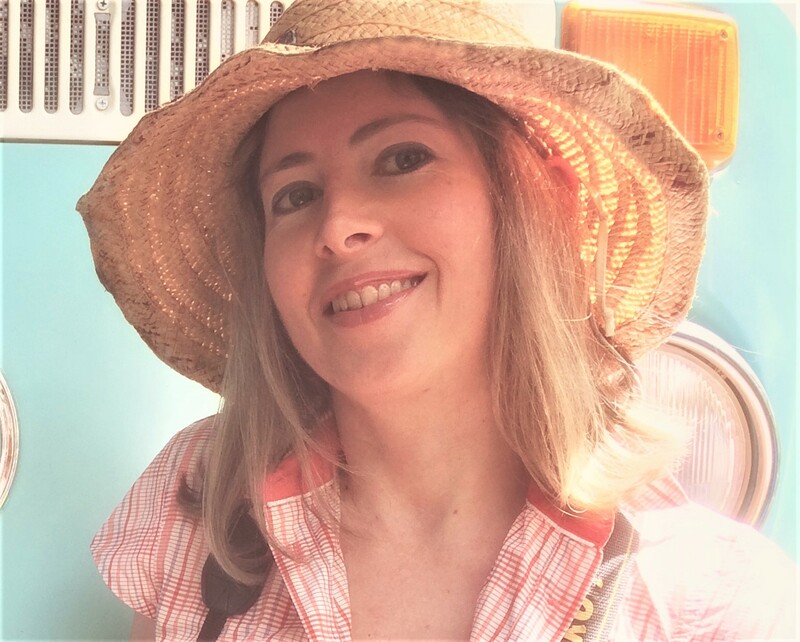 Hope you get to visit and try camping too – it is a lot of fun! I love such secluded places to go relax for some time. Patonga seems to a great place wen I don’t want to share the beach with a huge crowd of people. The images look beautiful and really inviting. The pearl beach walking track I would go for right now. I’ll have to wait till the time is right and then I’ll go visit this to me yet unknown beach. Hi Stefan, you’ll love this beach then! Yes, no huge crowds here! It is quite scenic here, and one of those areas – where to really capture the beauty of this land – it’s to be experienced! The walking track through the bushland really does take you away from everything! The normal vacation spot has more shopping than anything, and I hate to shop. A vacation should be relaxing, a rest break from normal life. Patonga seems likes the perfect place to relax and unwind. I hear so many people leaving one city to go to big crowded vacation cities and have never figured out the joy. I have stayed home during my vacations to avoid the crowds and shopping. I am suddenly interested in taking a vacation, thanks for the great article on Patonga. Hi Lance, your comment made me laugh, yeah no shopping complex here! I agree with you totally, a holiday is where you can relax, unwind and switch off, that’s what a holiday is meant to be about! You’ll love Patonga! Hopefully you can visit one day!